It’s Time for our Photo Contest! 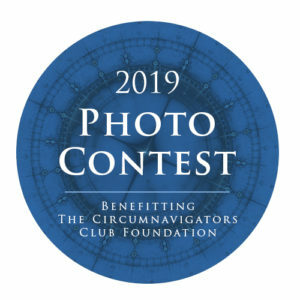 Please submit your best photos from places you’ve traveled for the Circumnavigators Club Photo Contest. 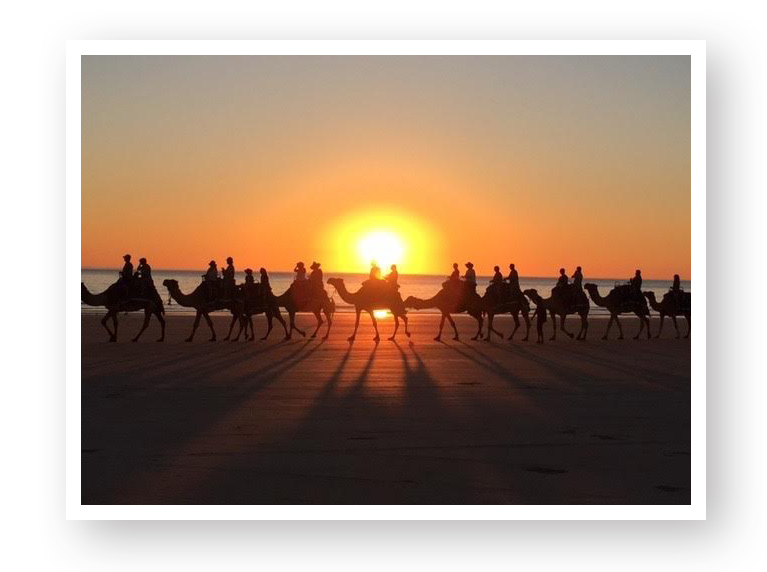 Our Annual Photo Contest is fun for our members and helps support the Circumnavigators Foundation. 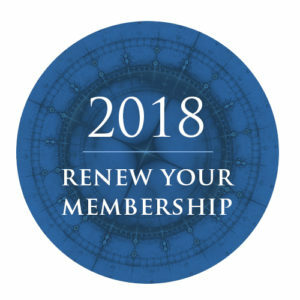 It is a great way to share our photos with the membership. 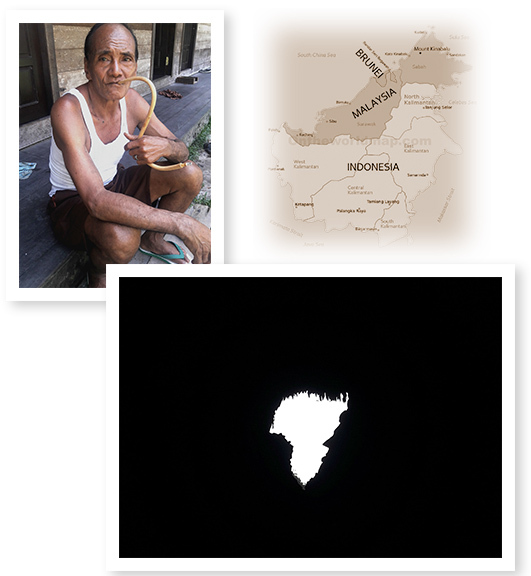 Photos are to be submitted via email as an attachment to photocontest@circumnavigators.org. Members are limited to five submissions. 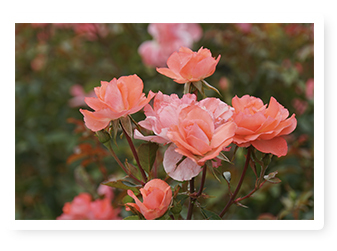 There is a $10 fee for each photo, which is a tax-deductible contribution to the Foundation. The photos do not have to be recent. There will be three winning places in each category as well as an overall best photo. The photos will be judged by professional photographers. We will contact you if we need more info. Entry fees can be sent via PayPal on our website or by check to “Circumnavigators Club Foundation” and mailed to the Circumnavigators Club, PO Box 465, Ramsey NJ 07446. Let’s support this event! Our goal is to raise $1000 for the Foundation. All photos will be shown on the Club web site. Roses in the Botanical Garden, Buenos Aires, Argentina. March will be a busy month for Circumnavigators. For those in the northern United States, it will be a time of looking forward to nice Spring weather. 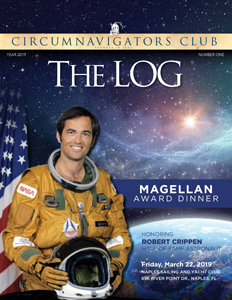 Most importantly for the Club, we are anticipating a fantastic Order of Magellan Event on March 22, awarding our top honor to space pioneer Robert Crippen. The event will be held in Naples, FL on March 22, and it isn’t too late to sign up. All members received an invitation in the mail. If you are in need of a reservation form, please contact Tracy Sancilio at club@circumnavigators.org or 201-612-9100. 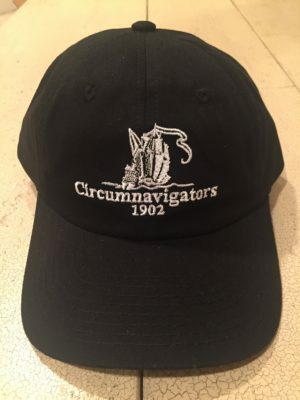 The Circumnavigators Club Annual Meeting will be held on Friday, May 17 at the Yale Club in New York. Members are invited to join the meeting, and guests are welcome to stay for lunch and the program. This year, C. Jim Foster will make a fascinating presentation on the Magellan Project which is planning to retrace the journey of Magellan 500 years ago. Invitations and details will be sent soon. There will be a memorial service for Ellen who passed away unexpectedly in January. 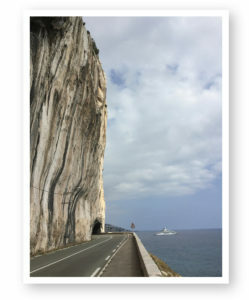 C. Donna Suddeth (Naples Chapter) took this dramatic shot on the Lower Corniche Road outside Villefrache-sur-Mer on the Mediterranean Coast of France. Donna recommends lunch at the Cafe du Jardin in Chèvre d’Or. During the Circumnavigators Club’s 117 years, there have been some truly extraordinary leaders. Past President Margaret Ellen Parke represents the best of them. Ellen passed away shockingly and suddenly at the end of a cruise to the Caribbean in the last days of January. She felt ill at the end of the cruise and was taken to a hospital upon the ship’s arrival in Miami. She passed away during an evaluation. As of this writing, many details of the incident and plans for funeral arrangements are still unknown. Always modest, Ellen might have disagreed with our assessment of her great leadership, but consider the facts. She made her first circumnavigation at the age of 12. Her father, Everett Parke, was a naval commander and diplomat whose career required many moves during Ellen’s early years. Among her “residences” was Saigon in the early 1960s where she spent seventh and eighth grades. While living in Norway, she first heard about the Club from Circumnavigator Mark Austad, then the U.S. Ambassador. Ellen asked the Ambassador if she could join the Circumnavigators, but was politely informed that the Club did not admit women. Ellen was disappointed (and annoyed) but within a year, she was contacted by Ambassador Austad and told that the Club’s by-laws had been amended to allow women membership. He enthusiastically sponsored her whereupon she became one of the first woman Circumnavigator in May 1984. Back in Washington, DC in 1984 she found there was no presence of the Club in the Nation’s Capital and considered resigning. But she received a call from Club President Bob Peterson asking if her if she would lay the groundwork establishing a DC Chapter, and the rest is history. Besides her active participation in the new Chapter (her father and mother became members), she held numerous positions in the Club and Foundation, culminating with her four years as President which concluded just last May. Ellen’s passion for travel and the love of the world (and, of course, the Nationals) were truly contagious. This writer was privileged to know her for about a decade, and found she was vivacious and enthusiastic, always on the mission to make the world a better place through love, friendship and understanding. On a Happy note…Wedding vows for C. Barb Roy and Robert Greene. 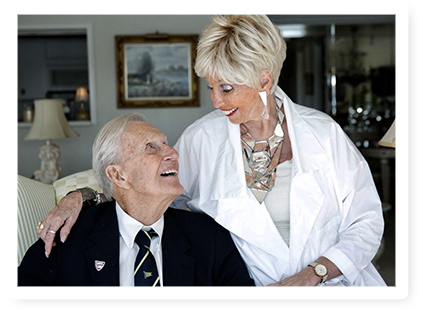 Barb and Robert were married in Naples, Florida, on January 25. 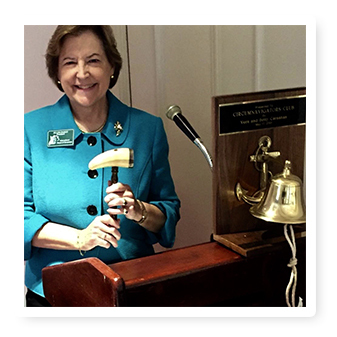 Barb is the former President of our Naples Chapter and a long-time active leader of the Club. The wedding news resulted in a major story in the Sunday New York Times, which even mentioned the Circumnavigators Club. Congratulations to Barb and Robert! 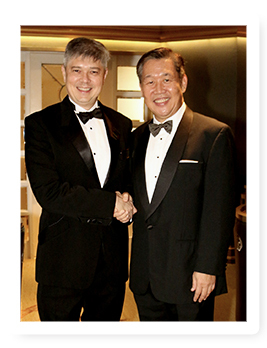 President Michael Palmer and Past President Richard Hoon. Outgoing Chapter President Richard Hoon passes the gavel to new President Michael Palmer. C. Palmer, partner in a notable law firm, has held a number of important civic and political positions in Singapore. He served as a member of Parliament and speaker of the House. He is former chair of the National Police Cadet Corps. Our thanks to C. Hoon and best wishes to the new Chapter President. President David Mink appointed the Nominating Committee for 2019 in early January. An update has been made – Second Vice President Brad Vogel will take the role Nominating Committee Chair in place of Past President Ellen Parke. Did you get your new issue of The LOG? The LOG has been mailed to all members. If you have not received a copy, please contact Tracy Sancilio at headquarters. The new issue is packed with interesting stories and outstanding photos. As always, we appreciate any feedback. We are now working on the next issue which will be published next summer. Let us know if you have any good ideas for stories or photos. Make sure to send us photos and brief news about your travels for the All Over the Map feature. For nearly a century, The LOG has carried a section called Scuttlebutt with news and info about our members. With the LOG only coming out twice a year, this news is far from timely, so we are now running Scuttlebutt on the website every month. Please send us news! C. Edwin Galkin (New York Metro) has recently completed his third circumnavigation by small plane. 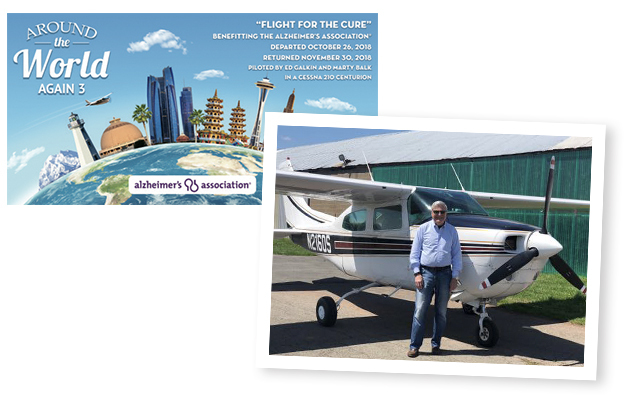 This trip was billed “Flight for the Cure” and was designed to bring awareness to the world of this terrible disease. Ed, along with his co-pilot Marty Balk, completed the round-the-world trip in Ed’s Cessna 210. It was quite an adventure which can be followed on the web site www.aroundtheworldagain3.com. Ed’s journey will be featured in The LOG next summer. Congratulations and thanks to Ed and Marty. Cs. 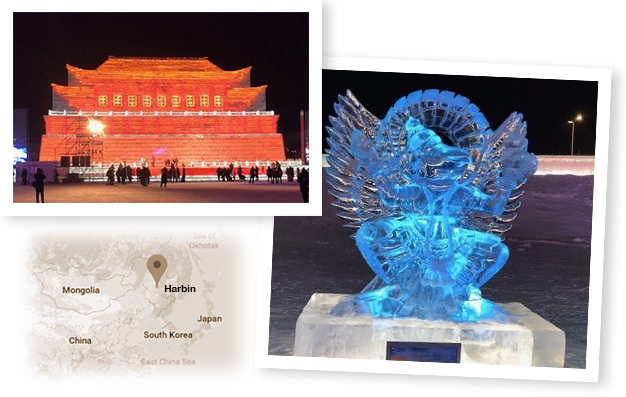 Sue Murphy and Suzanne Frye (New York Metro) visited the Ice Festival in Harbin, China. Sculptures and buildings were made out of clear ice and then turned colorful by reflected lights. 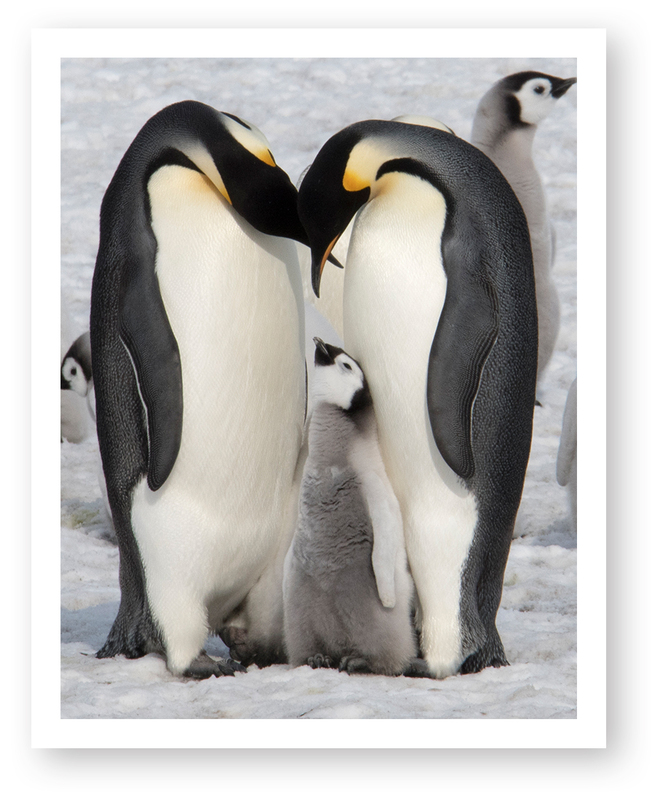 C. Ann Swinford (Michigan Chapter) took this shot of Emperor Penguins on Snow Hill Island in Antarctica. Do you have a good photo for The Last Shot? Please send to club@circumnavigators.org. 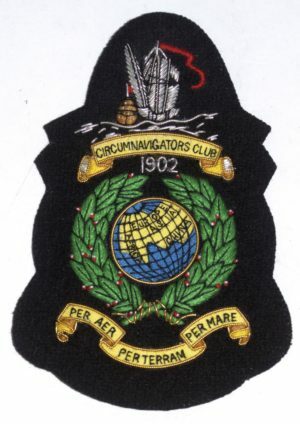 As the Circumnavigators Club enters its 117th year, we look forward to an exciting, eventful year, which will include our Magellan Award event in Naples in March. We know our members will continue to travel far and wide and we ask everyone to share their experiences. Canadian Circumnavigator Henri Van Bentum and his wife, Natasha, join us in the New Year wishes with Henri’s artistic renderings of the Winter Solstice, Christmas and New Year. 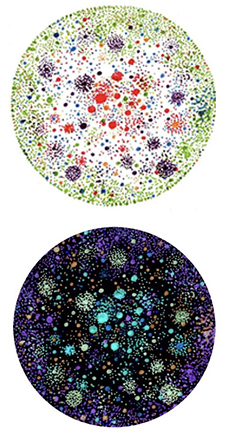 These paintings are “Organiverse”, created by Henri dot by dot. 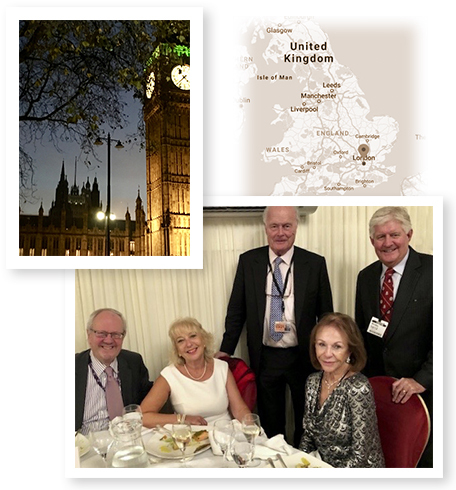 The U.K. Chapter held its 10th Annual Dinner at the House of Lords with about 60 members and guests in attendance. The event was hosted by Lord Richard Faulkner, formally known as Lord Faulkner of Worcester. Also attending was Lord Peter Inchcape, formally the Earl of Inchcape. The festive event included a tour of the chambers, a presentation by Circum Kane Avellano who circumnavigated by motorcycle. Circum Douglas Nickson, a relatively new member from Washington State, made a brief presentation about his decades-long project to duplicate the House of Lords library in his home. This was his first time to see the actual library. A number of Americans, including this writer and his wife Dottie, attended the memorable dinner. Thanks to Chapter President Helen Jenkins for organizing it. Harry Houdini is among the most illustrious of the Club’s early members. The magician was the “rock star” of this time, known to just about everyone. 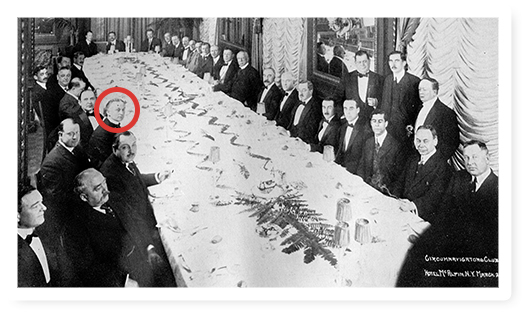 John Cox operates a web site Wild About Harry, and we recently reached out to John when he spoke about Houdini at the New York Historical Society. John is the ultimate expert on all things Houdini, but he never heard about his connection to the Circumnavigators. He was overjoyed to get new info and never-seen photos of Harry. 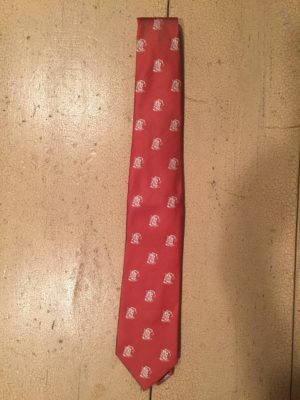 He posted the following item on his blog, which can be viewed via the following link. 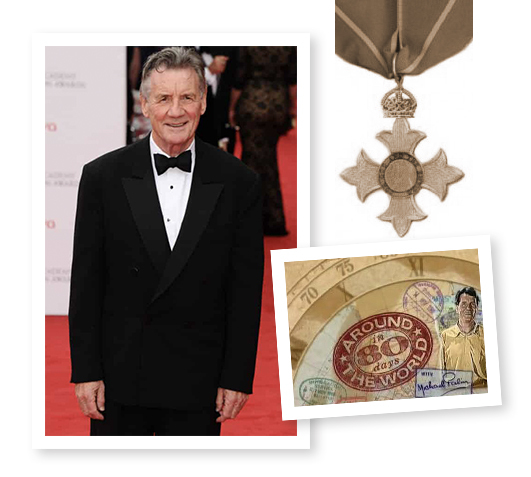 Michael Palin, perhaps best known for his role in Monte Python, was The Circumnavigators Club Magellan honoree in 2009, in recognition of his travel documentaries and writings. Now Michael has been knighted by Queen Elizabeth. Palin said, “I have been a knight before, in Python films. I have been several knights, including Sir Galahad. I don’t think it will (sink in) until I see the envelopes addressing me as Sir Michael Palin.” Congratulations to our Magellan awardee. 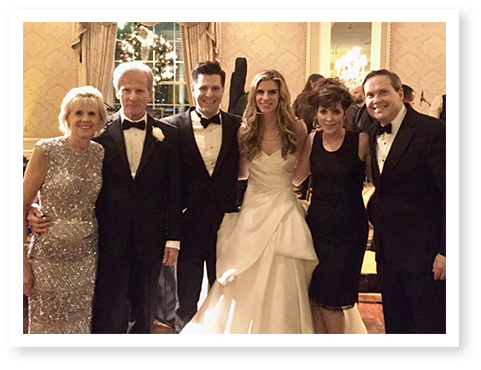 Circumnavigator Elizabeth Rider was recently married to David G. Schiff at Greenwich Country Club in Greenwich, Ct. Elizabeth is the daughter of Foundation President Greg Rider and wife Kathy. Circumnavigator Gunther Winkler took this stunning shot in Patagonia, Argentina near Lake Viedma, which is surrounded by mountains and glaciers. Gunther reported that shortly after he took this photo, a fierce wind blew him over and he landed on his backside. Gunther and his wife Maria are new members of the Naples Chapter. With the doom and gloom in the world, extensively reported by our 24/7 news, it is sometimes hard to remember how much we have to be grateful for. Circumnavigators know that violence and weather catastrophes have been around throughout history. But we also know that advances in medicine, technology and communications have improved life for many of us. These advances have certainly made it easier to see the world and work to make it better. Take a moment to embrace the spirit of gratitude. 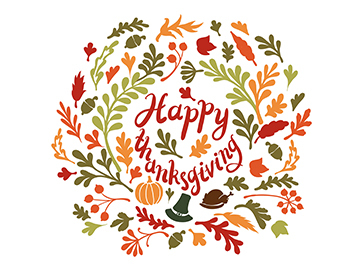 Happy Thanksgiving to all our members, family and friends. 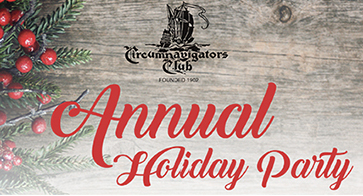 Celebrate the Holiday Season with fellow Circumnavigators at The Explorers Club! 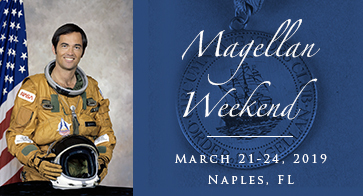 An email was sent to all members on Friday, November 2nd regarding flight and hotel reservations for Magellan Weekend honoring Captain Robert Crippen March 21 – 24, 2019. Please check your email for details. If you did not receive the email, please contact headquarters at 201-612-9100 or club@circumnavigators.org. Circumnavigator Steven Barnett of Panama City, Panama (HP1STB) is an amateur radio operator who has proposed forming a group for Club members. Circumnavigators can visit members on the airwaves at home on when traveling. 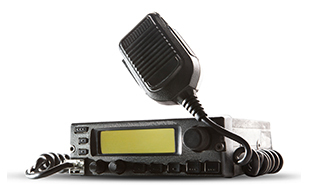 If you are a licensed ham radio operator, contact Steve at HP1STB@stevenbarnett.com. Do you have any noteworthy travel tips that most people would not think to keep in mind while traveling? Something you never thought you’d need to remember when setting out on the next adventure? 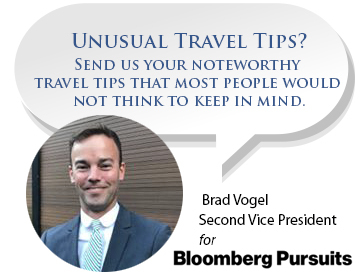 If you do, please send them to Second Vice President Brad Vogel at Brad.Vogel@gmail.com, as he is happy to funnel them to editor Chris Rovzar who heads Bloomberg Pursuits. Rovzar, a friend of Vogel’s, has requested any travel tips that are especially interesting or colorful for upcoming articles. Circumnavigators Howard Matson and Peter Mosse found an interesting piece of Club history. 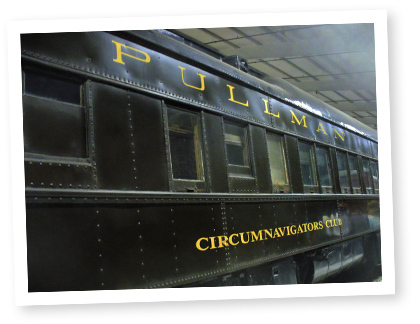 In the 1930’s, a Pullman car was named the Circumnavigators Club and served as an overnight train in the midwest until 1961. Howard found the info and Peter found the car, now in the Western Railway Museum in northern California. Peter had a chance to visit the train and meet its owner, Bill Kluver, who has maintained it for many years. More about this story in the next issue of The LOG. 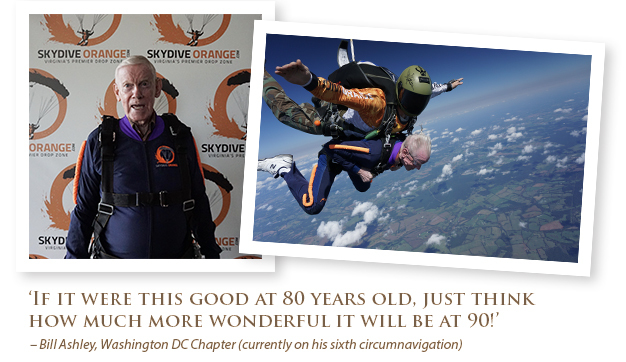 Circumnavigator Bill Ashley, Washington DC Chapter, found a daring way to celebrate his 80th birthday. For the first time, he made a sky dive in Virginia. Fellow Circumnavigator Ray Olson made a jump before Bill. He says, “The lady videographer asked upon my landing — ‘How was it?’ and I responded — ‘If it were this good at 80 years old, just think how much more wonderful it will be at 90!’ She replied that she liked my attitude.” Bill is currently on his sixth circumnavigation. 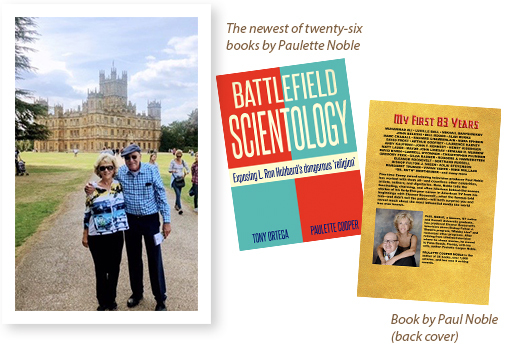 Paul and Paulette Noble have each published a new book. It’s the first one for Paul and the 26th (!!) for Paulette. Their books are available on Amazon. Paul and Paulette are co-presidents of the Palm Beach Chapter, and recently returned home from a trip that included a visit to “Downton Abbey” in England. Congratulations to them! Circumnavigators Sue Murphy and Suzanne Frye (New York Metro) took an extensive journey to southern Asia, and our Club cap made some appearances. The shot here was taken in the Raja Ambat Islands. Members are encouraged to take their caps on their travels to boost the Club. 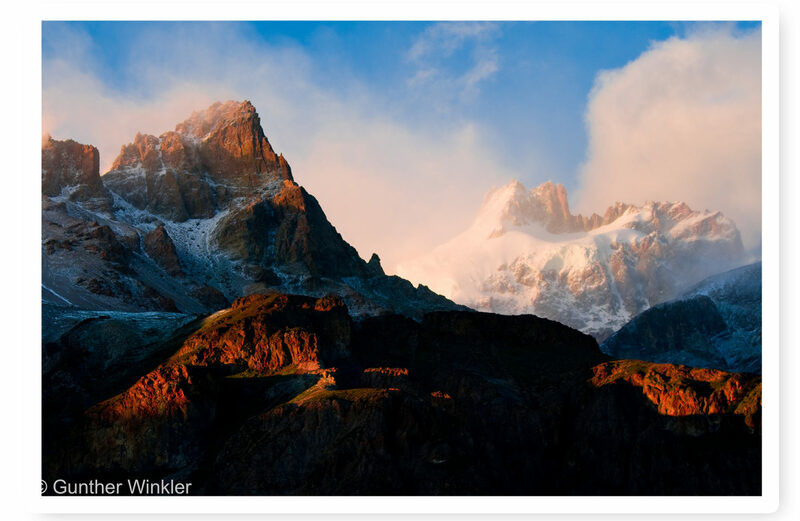 Circumnavigator Albert Podell, author and adventurer, traveled really far off the beaten track to visit northern Caucasus. 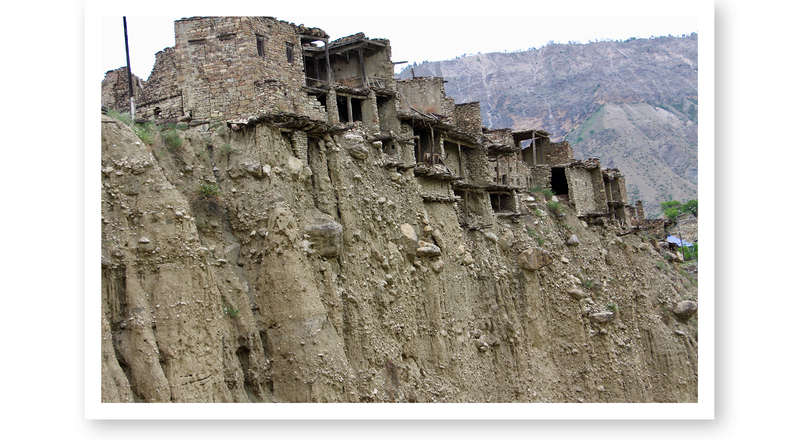 An 85-year-old woman is the last inhabitant of this crumbling village he found along the way. Albert’s “white-knuckle” adventure will be featured in the next issue of The Log. …More about these new members will be in the next issue of The LOG. Do you use Facebook? Join The Circumnavigators Club Group Page. How to join our Group…If you already have a Facebook account, log on, then go to the search field in the blue bar at the top of the screen. 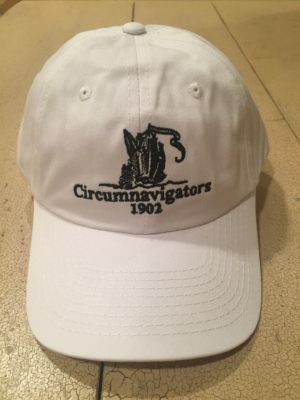 Type The Circumnavigators Club and hit enter. That will take you to the Club’s page. Click on the “ask to join” button. You will be asked whether you are a Club member and, if not, whether you have been around the world. Within a couple of days, one of the “admin” monitors will approve your request to join. The page is “closed,” which means that only those approved by the “admins” can post items on the page and see who is part of the group. If you are not a Facebook user, you will need to get an account first. How we interact on the Group Page…What is the most interesting island you have ever visited? 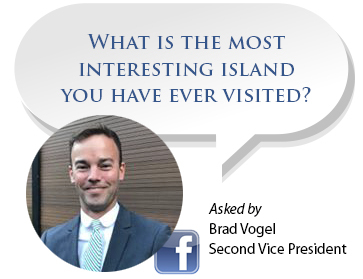 Second Vice President Brad Vogel asked this question on the Group page and we got a lot of interesting responses, including two from New York Metro members who said Manhattan and Staten Island. Here are some of the other responses: Mauritius, Malta, Papua New Guinea, Ocracoke, Maui, Autitaki (Cook Islands), Galapagos, Madeira, Newfoundland, Trinidad, Lanzorate, Zanzibar, Vito Levu, Vabbinfaru, Palmerston Island, Bermuda, New Caledonia, and others. Intriguing, isn’t it? Members are entitled to free cards which are a great tool for spreading the word about the Club to potential members or friends. 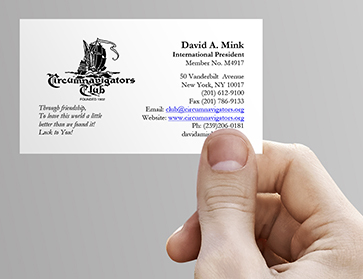 Just contact Tracy at headquarters at club@circumnavigators.org. 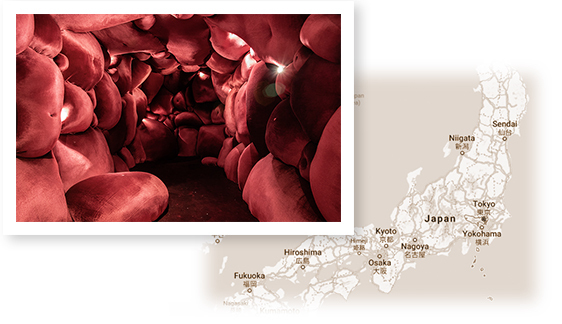 Circumnavigator Natalie Clark, a member of the DC Chapter and a noted artist, has a new exhibit in Tokyo. It is at The Container until November 26, 2018. Natalie’s work, called “Into the Curve,” explores womanhood and women’s rights. It transforms the confines of The Container into an interactive sensory environment, covering the entire interior of the gallery (walls, ceiling and floor) using traditional upholstery techniques. The work is intended to allow reflection on womanhood, fertility and femininity, and help to facilitate a discourse on women rights internationally and in Japan. It is inspired by the public and media rejection of the #MeToo movement in Japan. 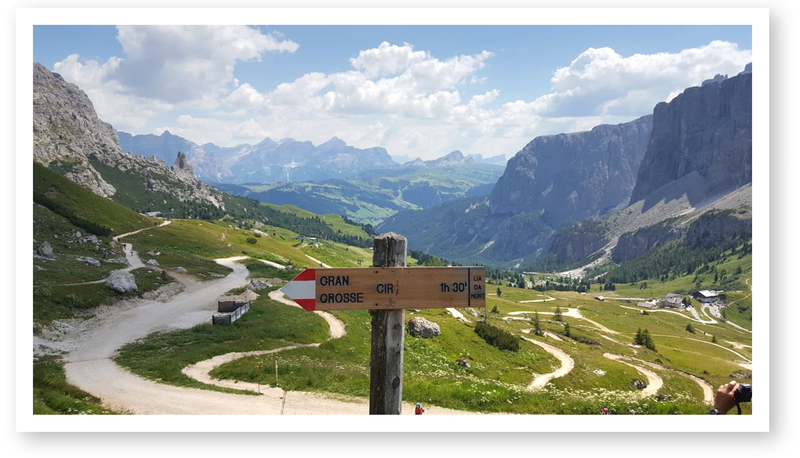 UK Chapter President Helen Jenkins enjoyed a walking holiday in the Dolomites in Italy. 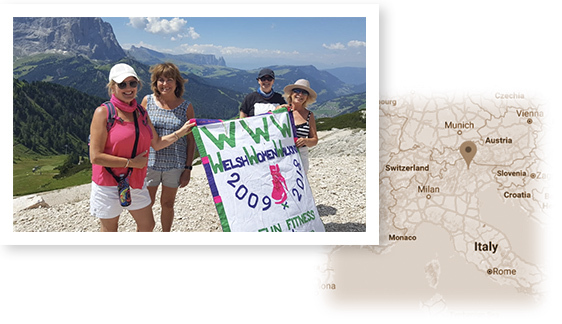 She was with her walking group Welsh Women Walking. The banner was made for the group’s march in June to celebrate 100 years since some women got the vote in the UK. The banner now travels with them wherever they go. In the photo, Helen is on the right. 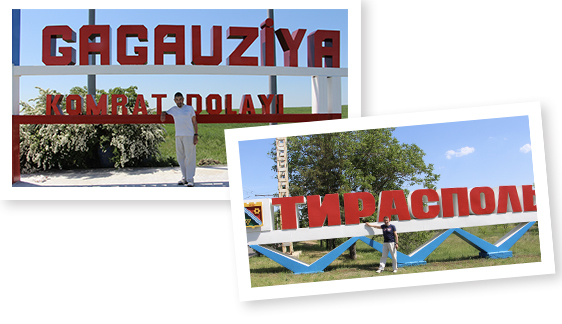 Albert Podell, New York Metro, went this year to the independent, but unrecognized, countries of Gaugazia, Abkhazia, Western Sahara, and Northern Cyprus. This, following Al’s earlier visits to Somaliland, Transnistria, and Antarctica, will tie Al for first place on the list Wikipedia maintains of the travelers who have visited the most “countries,” which includes several breakaway republics that are recognized as independent entities by only a few nations. Next spring Al plans to visit the final two. Helen Jenkins shot the long winding road in Italy on her walking tour. There was a time when this writer found Labor Day to be a bit of a downer. It meant summer was over, back to school or work, and the end of those fun carefree summer days. That all changed when I became a “snowbird”, spending the winters in sunny Florida where it’s summer all year long. I am sure it is the same feeling for the hundreds of Circumnavigators who live in Florida or other sunny climes like Phoenix and San Diego. Even those members who live in colder parts of the world, winter is a great time to travel—especially to the Southern Hemisphere where it’s summer! It is always amazing how our members constantly travel to remote places in the world. The problem is that we often don’t hear about the trips. 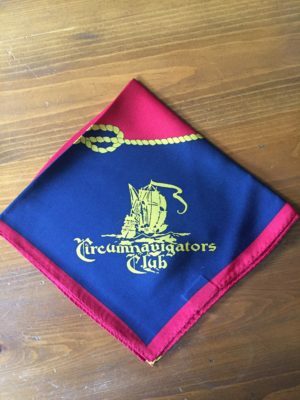 In addition to our mission to make the world a better place, The Circumnavigators Club is a sharing club. 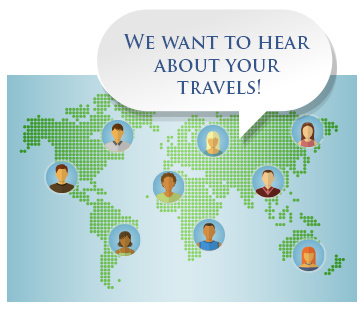 Let us know about your travels and experiences. Just a few are listed below in the Scuttlebutt section below. To make it easier, just click on this email davidamink@me.com and send us a word or two about your recent trips. If we need more info or photos, we will contact you by email. 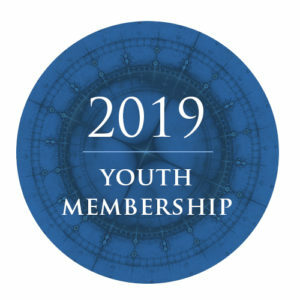 There are still a few spots left for the annual dinner at the House of Lords, hosted by our UK Chapter in London on Monday, December 10. It’s guaranteed to be a special, memorable evening. If you want to attend, please contact Helen Jenkins at helen_jenkins@btconnect.com or club@circumnavigators.org. Circumnavigator Alice Lentzen, Riverside, Illinois, visited the heart of Borneo and was a bit dismayed to find the wildlife, including orangutans and sun bears, to be severely endangered. But, she found the people to be “friendly, honest and heartwarming.” She got the photo below of a fellow with his homemade cigarette holder. She also marveled at the spectacular caves and other natural formations. The other interesting photo below was taken from inside Deer Cave, the second largest cave in the world in Sarawak. Millions of bats exit at dusk and can be observed from a viewing platform. The photo looking out, shot by cell phone deep inside the cave, seems to show an image of Africa, and if you look carefully, the profile of Abe Lincoln. 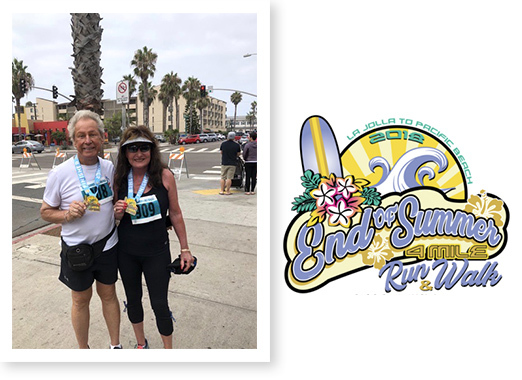 Circumnavigators Arthur and Virginia Foster, Pacific Southwest Chapter, completed the End of Summer four-mile run from La Jolla to Pacific Beach. Virginia is the Chapter President. Where in the world is Flint Island? 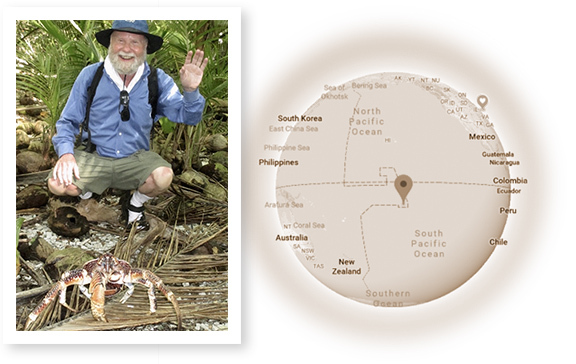 It seems like Circumnavigator Don Parrish has been just about everywhere in the world, but this year he traveled to the Southern Line Islands of Kiribati, which included Flint Island. Flint was discovered by Magellan on February 4, 1521, just 12 weeks before his death. Don was amazed by the large coconut crabs that hide in holes on the island. The crabs are estimated as about 60 years old and weighing 20 pounds. Don got a close up look but stayed away from those big claws. 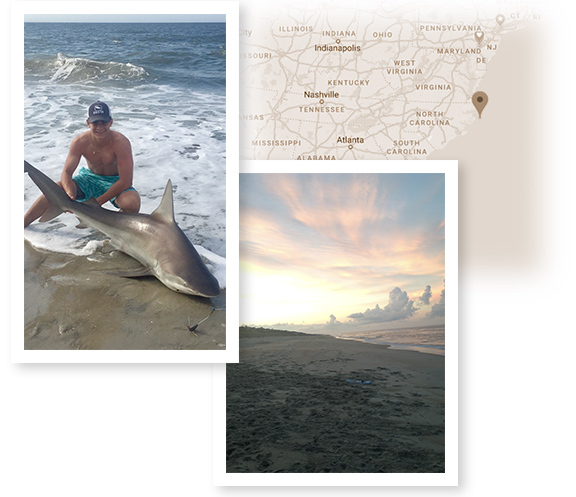 Executive Director Tracy Sancilio and her family vacationed this summer on North Carolina’s Outer Banks, where her son Michael landed a good size shark on the beach. Circumnavigator Larry Glick, Rowlett TX, has a serious hobby of shooting exotic birds and animals in the wild. 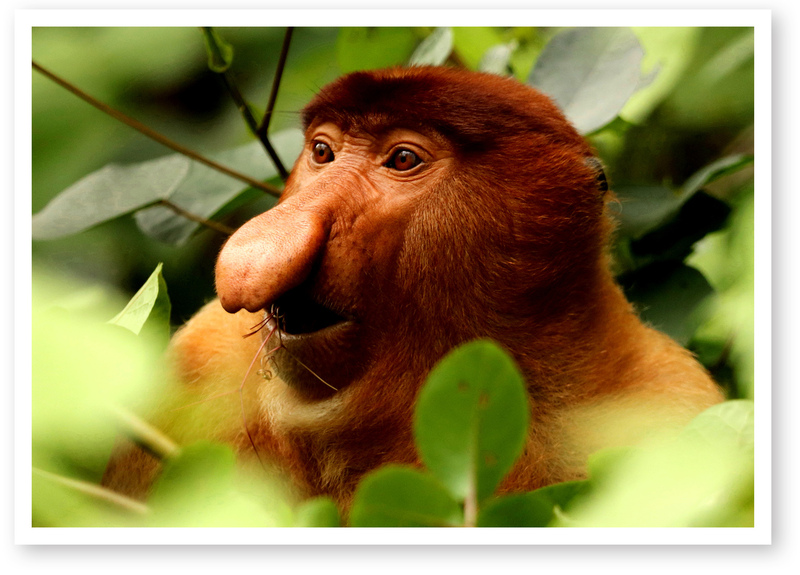 He captured this shot of a Proboscis Monkey in Borneo. More of Larry’s photos will appear in the next issue of The LOG. Do you have a good photo for The Last Shot? Please send to club@circumnavigators.org.